It is with heavy hearts that we announce the passing of our mother, grandmother, great-grandmother, aunt and sister, Evelyn Falkiner, on Nov. 26th, 2018, just a few weeks shy of her 102nd birthday. Evelyn Mary Bourgeault was born Dec 15, 1916 at Blaine Lake, Sask, the fifth of eleven children of Victor and Mary (nee Crowe) Bourgeault. She spent her childhood and youth in Blaine Lake, where her father built and operated a hardware store between 1913 and 1945. After High School, she studied music with the nuns at the Convent of Sion before entering the Saskatoon Business College in 1942. Upon graduation, she was hired by the Hudson’s Bay Company to work in Accounting. Evelyn wore many hats at HBC; she often modeled new fashions, and would work the floor during “Bay Days” sales events. Within short order she attained the position of Supervisor of Accounts Payable. When war broke out, Ev joined a Girls’ Club, sponsored by the Knights of Columbus and was active in organizing social events for military personnel stationed at Saskatoon. It was at one of the dances that she met James “Jim” M Falkiner, the eldest son of Tom and Charlotte Falkiner of Kamsack. After his discharge, Jim returned to the CNR, working as the Express Messenger on the train that ran from Saskatoon through Kamsack. They married on June 1, 1949 and remained in Saskatoon until 1952 when Jim was appointed the CNR Express Agent at Kamsack. They moved into a home he built and they finished together. In 1954 they held the winning ticket on a raffle for a boat and motor, which prompted them to obtain a lease on a lot in Jubilee Subdivision at Madge Lake. Here they erected a cottage which remains to this day, the family 'hub'. Evelyn was an active member of St Stephen’s Catholic Church. She was a member of the Catholic Women’s League, the choir, and at various times, she was the organist. She was instrumental in organizing a group of young mothers in the Parish to create crafts for the annual bazaars. 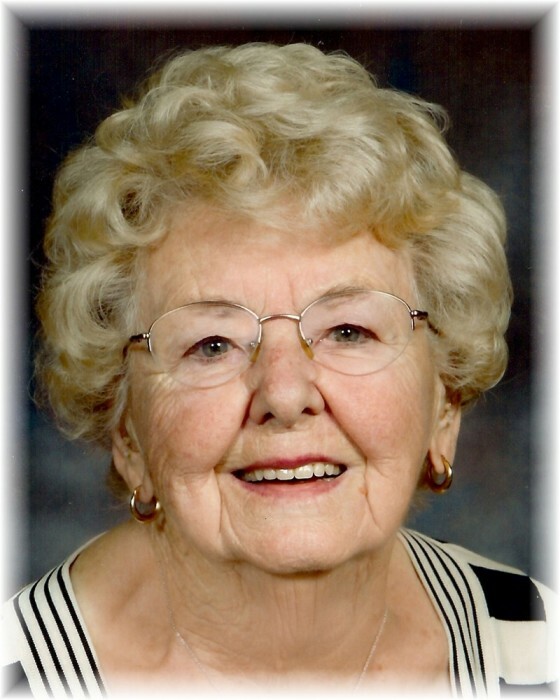 Evelyn was a past President of the Kamsack Hospital Auxiliary, a member of the Legion, and a past President of the PTA for the Assiniboine School. From 1961 to 1967, she was employed fulltime outside the home as the Secretary to the Manager of the Bank of Montreal at Kamsack, during a time while caring for her growing family of four children. In 1967, Jim was transferred with the CNR to Thunder Bay Ontario. After temporary employment with the Toronto Dominion Bank, Evelyn returned to the BMO as a Manager's Secretary and Supervisor. While in TB, she became active in fund-raising efforts with the Welcome Wagon. She also took up bridge, which became an important social pastime in later life as a widow. In 1972, they moved to Winnipeg where she worked as the Private Secretary to the VP (MB-SK Division) at the BMO main branch. During these years, Ev and Jim enjoyed travel overseas and to the Caribbean. They also started spending time in Florida, first in Dania, and later in a mobile home they purchased and renovated in Pembroke Park. Jim retired in 1977 and Ev in 1978. They made Madge Lake their official residence, spending summers there and winters in Florida. Her last winter in Florida was in her 100th year. Evelyn was a very gifted musician, singer, and artist. Her hands were never idle. A talented knitter from an early age, she was a member of the neighborhood “Knit and Rip” club at Madge. She designed and knitted Cowichan sweaters for the entire family. Even the dog was a recipient. She engaged in needlepoint, crochet, copper tooling and paper tole. While in Thunder Bay she studied wood carving and joined the wood carver’s guild. In retirement, she became a member of The Harmony Center Seniors' Glee Club in Kamsack and was a long-standing member of the Voix du Nord in Florida, and sang alto with them right up through her 94th year. Evelyn will be greatly missed by her family. Her love was unconditional and steadfast. Her unwavering faith and trust in God was firm and constant. She and Jim reared their children with compassion, humor, and love. She exemplified social responsibility. These are all qualities her children and grandchildren will carry with them throughout life. Evelyn was predeceased by her husband Jim (1989), her parents and siblings, namely sisters Angeline Lucas, Anne Bourgeault, Marguerite deFaye, Blanche Olivier, and Bertha Chamney, and brothers Joseph, George, Arthur and Leo Bourgeault. She is survived by her sister Rita Lawrence, by her children, Carole (Bob) Stoyand, Maureen Falkiner, Robert J Falkiner (Marolyn), Trisha (Pat) Kelly, by grandchildren Bob (Tracy) Stoyand, Mike (Kelly) Stoyand, Dan Falkiner (Glenda) and his mother Marnie, and by her great-grandchildren Summer and Bobby Stoyand, who affectionately called her GiGi. A funeral Mass was held on Saturday, December 1, 2018 from St Stephens Roman Catholic Church. Donations may be directed to Kamsack Eaglestone Lodge or the Kamsack Legion Hall elevator fund.